The primary step in inducing autophagy involves membrane nucleation, controlled by ULK complex and Beclin1. Inhibitors of positive regulators of of the ULK complex and Beclin1 have been demonstrated to block autophagy. These include inhibitors to the MAP kinases, JNK1, ERK and p38. The induction of Atg protein and LC3 proteins is required for vesicle expansion and formation. Inhibitors of the class III PI3 kinases can block autophagy. 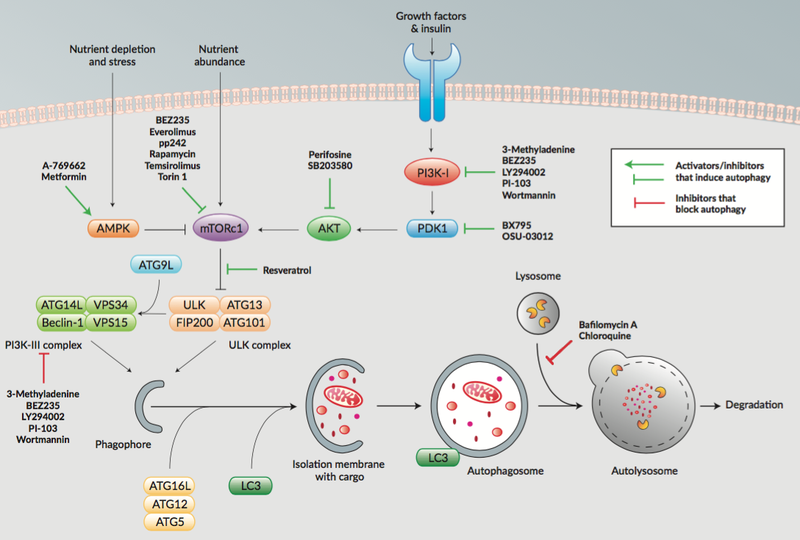 In a later step of the autophagic process, inhibitors that inhibit lysosome acidification essentially block the formation of autophagosome and autophagic degradation.